Looks gorgeous but lacks bite. What is it? A dinosaur-centric theme park management game. My security advisor in Jurassic World Evolution has offered me a mission. I can improve my standing with the security team by breeding a velociraptor. This sounds ill-advised. Even more ill-advised is his demand that I breed it to have a genetic modification that makes it even more aggressive. This is the same security guy who wanted to test the park's security system by letting a dinosaur loose in a park full of visitors because the game had decided to teach me about tranquiliser darts. What's wrong with learning about tranquiliser darts while the park is closed? If this theme park management sim allowed me to fire employees I would be shoving this guy on the next helicopter out of the Muertes Archipelago. However, it does not. Jurassic World Evolution is in a tricky spot. It's a gorgeous game—especially in terms of how the dinosaurs look—but it's beholden to the movie franchise in ways which disrupt management sim play. I'm also many hours in and really starting to chafe against the lack of depth in multiple areas. You begin your dino park management career on Isla Matanceros. You learn the core patterns of the sim, so placing buildings, making sure they're powered and connected to pathways and then start to fulfil contracts that gradually unlock more options. Completing key missions opens up new islands. Each island has its own challenges, so on Matanceros you get your bearings, Muerta is wracked by storms which can damage buildings and release dinos, Isla Tacaño’s park is bankrupt so you make the island profitable, and so on. By contrast, Isla Nublar—the setting for the original book and movie—is an unlimited sandbox area. 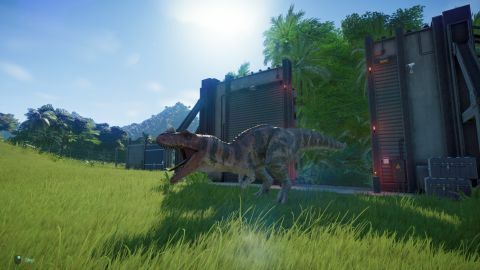 You'll also be researching upgrades to buildings and genetic modifiers and medications for dinosaurs, digging for and analysing fossils to increase your genetic databank, and generally keeping an eye on the visitor experience in the park. You can move between islands at any time, augmenting older parks with new research and new dinos. Balancing out the security guy who seems to hate security, you have a science division and an entertainment sector, each of whom can offer you their own contracts and thus boost your coffers. The three exist in an uneasy triangle so boosting a relationship with one can tank the opinion of another. To paraphrase another nineties movie icon, Jurassic World Evolution is a full-on Monet. It looks exactly right at first glance, but the closer you look the less it holds up to that scrutiny. At first there's a real sense of wonder. The first time you see a dino getting released from its creation centre is amazing. Actually, that cinematic is always amazing, as is watching the dinosaurs loll about as they’re airlifted while tranquilised. I loved watching them fight for the first time too (this was an error brought about by me assuming the carnivore would prioritise the live goats over another dino). That initial thrill was also true of using the tranquiliser dart in first-person view or taking photos or piloting the helicopter. The problem is that over time the lack of variety in the game emerges. With the bankrupt park the challenge was simply to choose some buildings to sell. After that you build the basics and start expanding. So it was the same as the previous levels but prefaced with selling off some assets. It can alter the initial difficulty a bit, but mostly that just seemed to introduce periods of waiting for cash to accrue. For the stormy island I just put in a lot of storm warning centres and put a second ring of fencing around some enclosures and the park now seems invulnerable to the elements. The entertainment, science and security factions existing in tension is a way to distill the themes of the franchise but in practice it feels bizarre. Pursuing one faction too hard means you’re at risk of sabotage from the others. I was building up my science reputation so the security team opened all the gates and let the dinosaurs out. I mean, what? At another point I was leaning too hard on another faction—I think it was security—and one of the neglected factions gave the dinosaurs avian flu. Essentially you’re asked to believe that you have a staff made up of people who will just happily cause the deaths of holidaymakers and the dinosaurs they purport to care about or rely on for their income for… attention? Combined with the lack of ability to tell how individual visitors are reacting to the park this further erodes any sense of wonder and love for these creatures. It also feels like a disastrous business structure. Give me the bloody org chart and let me rejig it, for goodness sake. The missions can also feel really ham-fisted in trying to engineer action. For example, my entertainment specialist popped up with a $400,000 contract to get one dinosaur to win two combat victories. Fine, people might be into a dino death match. But you don't need to make them fight in front of a viewing area, or at a scheduled time or to fix a particular problem with visitor boredom—there’s no attention to detail. As you might have guessed, this mission lowers my standing with security and science. However, there’s a security mission which asks you to do the exact same thing but this time it increases your security rating and lowers your standing with entertainment and science. Additionally, I was in the theme park management mindset of trying to curate a park which people would enjoy and where my animals were safe. It felt really jarring to breed animals which would disrupt that, or put themselves or visitors in danger without a good reason stemming from the visitors or dinos themselves. These situations also created busywork. For example, the aggressive velociraptor got out so I had to send out the tranquiliser team to take down the dino, get a ranger team to repair the fence, then send in the relocation helicopter to pick the raptor up and plop it back in the repaired pen. You can't assign these teams to types of tasks so there’s a lot of clicking. I wanted to be able to assign one ranger team to restocking herbivore feeders. I couldn’t so I either needed to drive around myself and do them one by one, or assign individual tasks to the ranger team’s empty slots, then come back and add more when those were finished. Driving around is interesting the first few times—you get into a jeep and pootle round the park. You can fulfil the aforementioned tasks by clicking if they pop up nearby (although it’s just a click rather than performing an interesting action). You can also take photos of the dinos à la Pokemon Snap or administer medication using the rifle. I thought I would spend a lot of time in this mode, down on the ground, but after the initial "holy heck!" beauty of the dinos wears off, the behaviours and environments just aren’t interesting enough to watch them for long. This lack of depth runs through the game. The buildings look very samey—I found it hard to pick out the expedition center as opposed to the fossil or research centers at a glance. There are also no variants on each building type so far, so each of the parks is only really differentiated by layout. There are some dino cosmetics and you can change the look of the jeeps but managing the park demands too much of a zoomed out view for those to be striking. I've just unlocked a heap more dinosaurs because I can now access more dig sites for fossils, but I'm struggling to find a reason to keep playing. The dinos look beautiful, but watching them doesn’t reveal any emergent lizard stories. Taking a broader view, my parks are ticking over fine so there's not really much to do except send rangers to restock feeders and fulfil contracts in order to unlock more options. I was trying to find a way to embody a person at the park, maybe follow them as they wandered or step inside the viewing gallery or the monorail as them. You can't do that either (although I can unlock the ability to ride a gyroscope). The people wander around but you can't click on them to figure out what they're enjoying, or what they've just seen. They're just the same few character models milling about to create the sense of crowds. It's also weird to realise there are no children in the park. I get that maybe that's a game ratings choice or a personal choice if you're also showing people get eaten or attacked when dinos do escape. Kids’ fascination with dinosaurs, however, is something the franchise uses—particularly the iconic first instalment—so this childless theme park seems bizarre. There are also issues with the pacing of teaching moments—a colleague and I both encountered several sections which teach you how to do certain things hours after working them out for ourselves. Contracts also appear with requests you’ve fulfilled many times previously but you’ll only earn the points and cash if you do them now rather than the game using them to sculpt your relationships as you play. Oh, and I've frequently encountered sections where I was just waiting for money to accrue for a particular building or dinosaur. I suspect the intention is that you spend those moments driving around, maybe taking photos for little cash boosts, but that wore thin quickly and I found myself dealing with emails or playing a mobile game in the background. At this point I can't help imagining what a mod community could do with the game, particularly in terms of building variety or missions. But Jurassic World Evolution is not launching with mod support. To be honest, as it’s a licensed project rather than one based on Frontier’s own intellectual property, I can’t imagine that situation changing. In its current form there's certainly enough for you to lose entire evenings to, and the dinosaurs themselves are absolutely beautiful. I actively want to look after them. But I'm just not finding the layer which keeps you coming back after that primary experience loses its sheen.